On the 100th anniversary of the first water line being laid in Rhododendron, the Rhododendron Water Association has an accomplishment to celebrate. In November, the Oregon Health Authority (OHA) recognized the service district for outstanding performance. The Rhododendron Water Association manages 363 connections, including 10 commercial customers, from John Lake Road to the Forest Service boundary on Mount Hood. This recognition came after the OHA's last survey of the mountain system. "This has been a goal the board has been trying to achieve every time we've had a sanitary survey," said Steve Graeper, water association board president. 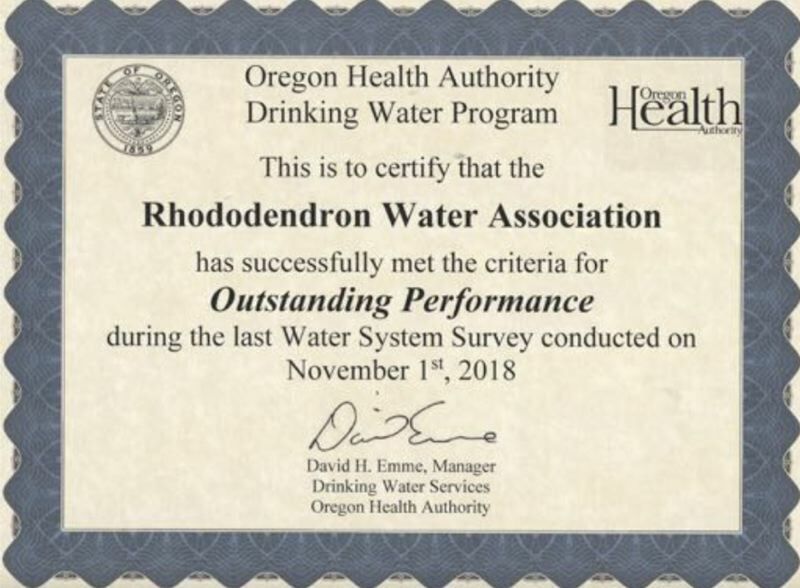 In 2012 and 2014, the association also received recognition for having the best-tasting surface water by the Oregon Association of Water Utilities. "That says a lot about our system as well," Graeper added. Graeper noted that in 2015, the OHA increased the cost of the required, routine survey by 300 percent, from $900 to $2,700, so he had a "financial incentive" to accomplish this longtime goal. Those systems which are designated as an "outstanding performer" are required to be survey less frequently. "Ninety-nine percent of why we hit outstanding performance is because of the excellence in performance of David Jacob (the system water master)," Graeper said. "For systems our size, this is (a feat). Of the 3,395 districts listed, only 283 have received this designation." What also sets Rhododendron's system apart is that it is a surface water system, drawing water from Henry Creek, whereas most systems being recognized are easier-to-maintain groundwater systems. "I'm proud of being the leader of this board — to help guide and facilitate the decisions, which allowed us to get this far," Graeper noted. "The decisions the Rhododendron Water Association have made over the past 10 years have helped move the association forward."